Below you will find the most common Linear, Moore-O-Matic and Linear Moore-O-Matic Megacode replacement remote control transmitters we carry. Just match the model number on the back of your remote control transmitter to the one pictured or find the model number of your receiver (This can be found where you see the antenna wire hanging from the motor head, you may have to take the lens cover off. If antenna wire is not hanging from motor head then you have an external receiver which is a box mounted somewhere in the garage with a antenna wire hanging from it the model number will be listed on the cover). If you are still unsure please Contact Us. 1-Button Delta 3 garage door opener remote control. Compatible with all Delta 3 system products by Linear. Dimensions 2 1/8" x 1" x 3 3/4 inches. Compatible Keyless Entry System DTKP. 2-Button Delta 3 DT-2A garage door opener remote control. 4 channel garage door opener remote control. Activates one DRG gate receiver and up to 3 separate Delta3 receivers. 256 + 64 different digital codes. Dimensions 2 1/8" x 1" x 3 3/4". 1-Button "Ladybug" Mini Key-Chain garage door opener remote control. Dimensions 2 1/8" x 1 3/8" x 1/2 Inch. 1-Button MegaCode garage door opener remote control. Compatible with all Linear-MegaCode systems, including LDO33, LDO50, LSO50 and LC075 series openers. LED and positive verify operation. Single channel remote with push button on front and top of remote. "Smart Button" coding – no dip switches. Battery, visor clip, and instructions included. Compatible Keyless Entry System MDTK. 2-Button MegaCode garage door opener remote control. 4-Button MegaCode garage door opener remote control. Activates one MegaCode garage door opener receiver. Dimensions 2 1/4" x 1 1/4" x 1/2 inch. Activates two MegaCode garage door opener receivers. New model MTR1 replaces MCT-11. Compatible with all Linear-MegaCode door operator systems, including LDO33, LDO50, LSO50 and LC075 series openers. Dimensions 2 1/2" x 2 1/2" x 1 1/2". Battery, visor clip, and instructions are included. 3-Button MegaCode garage door opener remote control. Activates up to three MegaCode Receivers. Dimensions 3 3/4" x 2". Activates up to two MegaCode Receivers. Visor Clip for Linear model DTD and DT2D door opener remote controls. Will not fit model DT4B remote. 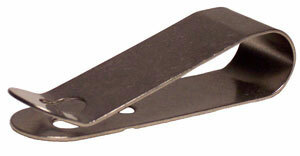 Visor Clip for Linear model DT4B garage door opener remote control. 3V Lithium Battery for remote control models MDT-1A, MDT-2A, and MDT-4A. Replacement battery for remote Control Model LBT/"Mini"T.
The ACT-31B 1-Channel Block Coded Key Ring Transmitter is designed for use with Linear's access control products. The Model ACT-31B is a single-channel device supplied with a quick-disconnect key ring. Also included are lithium batteries with a five-year service life. A unique 10-second time-out feature prevents the system from being shut down by a single transmitter transmitting continuously. Two type 2016 lithium batteries supplied. Minimum order quantity 10 transmitters.